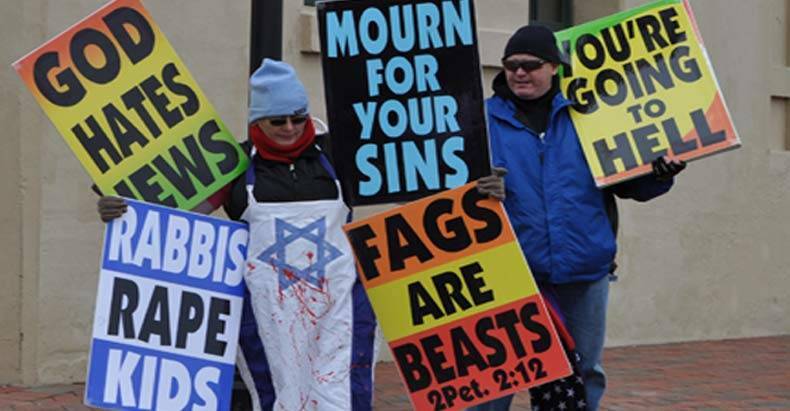 Topeka, Kansas – The infamous Westboro Baptist Church that is well-known for picketing funerals with bigoted protests made headlines again this weekend after members of the church had coffee thrown on them by a counter-protester who was upset by their antics. The man was arrested at the funeral of Beau Biden this Saturday, and will likely soon be facing a lawsuit from the Westboro Baptist Church. The Westboro Baptist Church actually loves to get attacked by counter-protesters, and they also love it when towns attempt to block them from protesting. That is because the Westboro Baptist Church is a business, that is designed to provoke people into doing things that can get them sued. They may or may not believe the hateful rhetoric that they promote. However, their true motivation is a financial one that has nothing to do with their alleged religious beliefs. Fred Phelps, the deceased founder of the church, was actually a lawyer until he was disbarred in 1979. The disbarment came after he was caught making false statements, and attempting use the courts to wage a personal vendetta against a court reporter named Carolene Brady. After his disbarment, many of the other members of the church, including Phelp’s children, have followed in his footsteps by becoming lawyers. They are now professionals at using their church and their protests as a major revenue source. On a number of separate occasions the church has collected fees from towns that attempt to prevent them from protesting, and they have also sued counter-protesters who have gotten physical. The financial motive was revealed when the church won a number of high-profile court cases in the 90s, winning $43,000 in legal fees in 1993, then again in 1995 for over $100,000. In 2006, the group told The Guardian, that they spend an upwards of $250,000 per year just on travel expenses. Margie Phelps, one member of the church, is actually a corrections officer, and officially listed on the Kansas Department Of Corrections website. In fact, six of Fred Phelp’s children are lawyers who work full-time for the Kansas Department of Corrections. Another Topeka attorney, Pedro Irigonegaray pointed out that while Fred Phelps was a lawyer, he used civil rights cases to make money even though he was a total racist. “He was more of a civil rights opportunist. There is a huge difference between taking cases and believing in the core values of the clients you represent,” Irigonegaray said. Whether or not the adults who run this lucrative business of hate believe their bigotry, is left to be determined. However, we can rest assured that the innocent children caught up in this hate, most assuredly do.